Abstract Climates: Helen Frankenthaler in Provincetown highlights key examples of Helen Frankenthaler’s work produced during summers spent in that coastal town and underscores their impact on her development as a painter. Beginning with work from the summer of 1950, the exhibition and accompanying catalogue focus on the artist’s output from the late 1950s through 1971. Abstract Climates illuminates Frankenthaler’s exploration of the relationship between landscape and abstraction, and offers new insights into the major role her work played in the development of Abstract Expressionism in America. Co-curated by Lise Motherwell, a stepdaughter of the artist, and Helen Frankenthaler Foundation Executive Director Elizabeth Smith, the exhibition was on view at the Provincetown Art Association and Museum in the summer of 2018, featuring some 30 paintings and works on paper with additional memorabilia from the artist’s life. At the Parrish, six large-scale paintings not previously included will also be on view. When Frankenthaler first spent time in Provincetown, in the summer of 1950, she studied briefly with Hans Hofmann, who taught that a painter’s entire experience of the world should come through color. Reflecting on the experience, Frankenthaler said, “My conscious interest was more in drawing and the drawing of color than in color alone.” Two years later, in her New York City studio, Frankenthaler painted Mountains and Sea (1952), a work that distilled in arcs and swaths of color the experience of another coastal sojourn, this time in Nova Scotia.That painting positioned the young artist as a force to be reckoned with. The light that is unique to places by the water became a constant in Frankenthaler’s work in the late 1950s and ‘60s, and Provincetown would be her lodestar. Yet it was a pivotal visit in 1951 to Jackson Pollock’s studio in another seaside town, East Hampton, that set the stage for groundbreaking experimentation. Pollock painted one image after another, using black enamel paint on unprimed cotton duck unfurled on the floor. To improve his control of the medium, he employed glass basting syringes. By the next year, Frankenthaler was using house paint and enamel, thinned with turpentine or kerosene, pouring the mixture from an empty coffee can onto unprimed canvas. The risk-taking she observed in Pollock’s Springs studio led to the evolution of the Provincetown years, from the vibrant watercolors of the Provincetown series (1960) to the experimentation with scale and process that engendered works like Cool Summer (1962; oil on canvas) to the fluid geometries of Indian Summer (1967; acrylic on canvas). The proximity of the ocean and the resulting mutability of Provincetown weather proved to be an ongoing inspiration for her. In the early 1960s, Frankenthaler began to experiment with the solvent-based acrylic Magna, and water-based acrylics, as seen in Summerscene: Provincetown, 1961 (acrylic on canvas mounted on paperboard), and continued to use oil, sometimes combining the two. 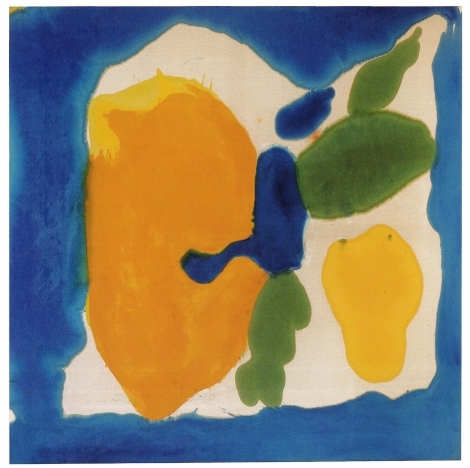 Abstract Climates: Helen Frankenthaler in Provincetown was organized by the Provincetown Art Association and Museum. The Parrish Art Museum’s programs are made possible, in part, by the New York State Council on the Arts with the support of Governor Andrew Cuomo and the New York State Legislature, and the property taxpayers from the Southampton School District and the Tuckahoe Common School District. The Helen Frankenthaler Foundation, New York.© 2019 Helen Frankenthaler Foundation, Inc. / Artists Rights Society (ARS), New York.